DISCLOSURE: I was provided product samples by the Happy Family brand for this post and giveaway, but this really is something Brielle enjoys at home regularly! I only promote and share products I personally use and recommend! To learn more, please review my disclosure policy here. 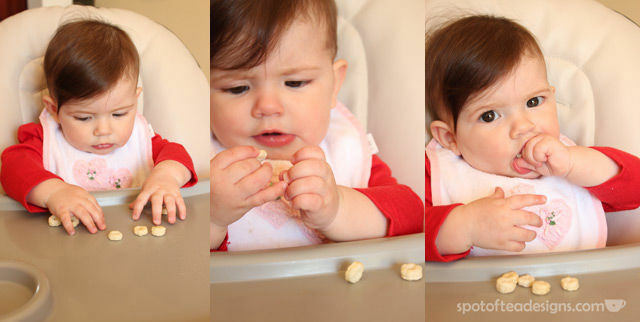 At 4 months the pediatrician suggested we start introducing solids along with our breastfeeding routine. While Derek and I are not the greatest eaters (I admit we can go a few nights without eating a vegetable) I wanted better for Brielle. I began doing some research on baby foods online and in stores, paying more attention to the ingredients list in those easy to serve pouches. 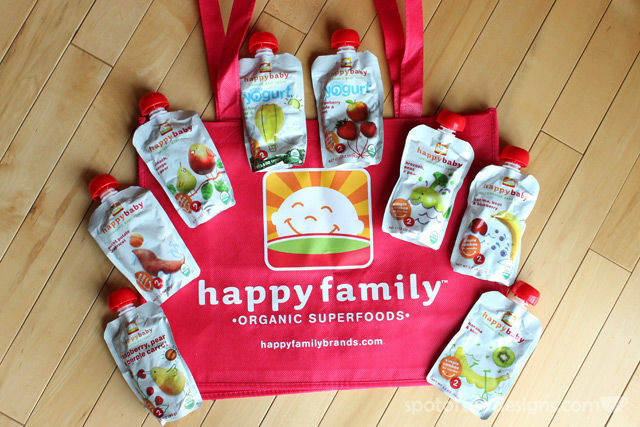 After some research, I came across Happy Family Brands and their lines of organic baby food. Brielle started with the stage 1 foods and after some practice getting used to a new consistency and taste that wasn’t mom’s milk, she happily moved into stage 2 combination flavors. It seemed that the broccoli, peas and pear flavor was a favorite! 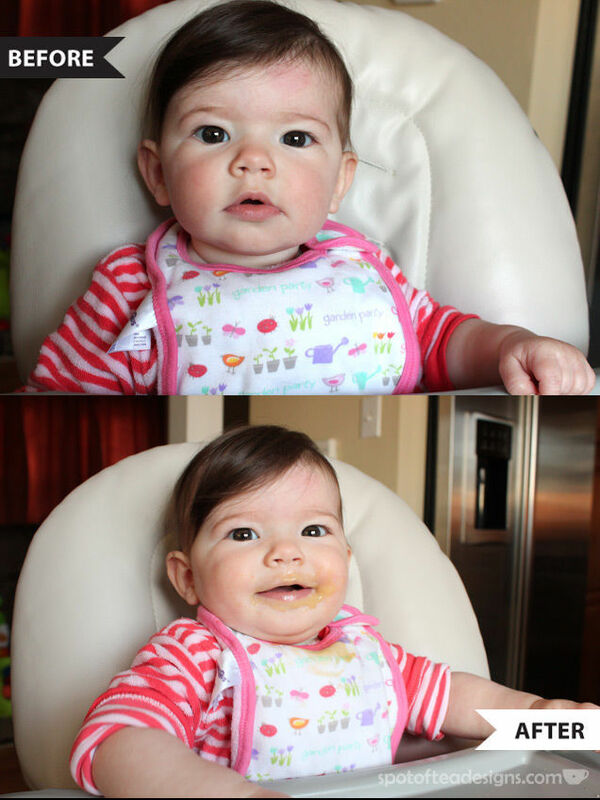 Because I love me some “before and after” photos, above you can see her trying out the bananas and kiwi flavor (and how much is actually worn on her face and bib)! Once she gets a little bit older, I plan to try out some of the Happy Tot level of foods, since you know this mom is probably never going to make butternut squash or beets. 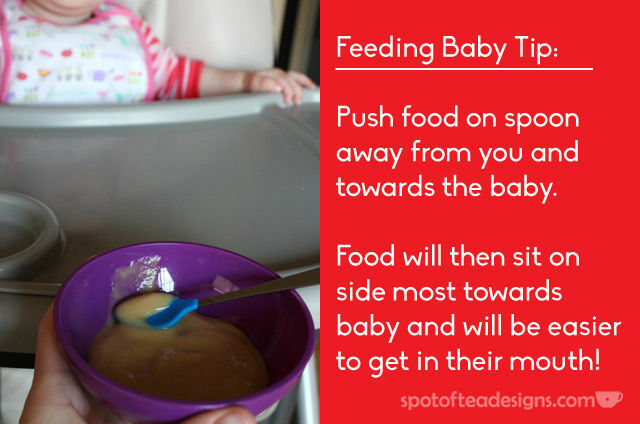 Overall, I’m happy to have found this healthy solution for her first introduction to solid eating! 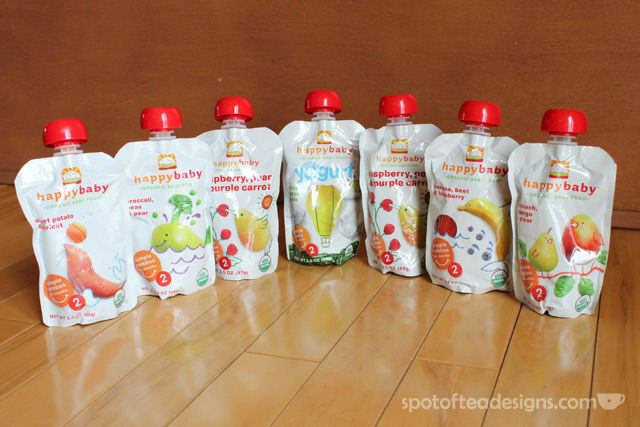 I’m happy to announce that the awesome folks at Happy Family have generously offered one Spot of Tea Designs reader a Happy Baby Package valued at $25!! This package is a selection of their most popular products for ages 6 months – 18 months, as well as additional coupons, educational resource cards and a reusable Happy Family tote bag! You can see some of the flavors listed above, but know that the flavors you get may vary. Enter to win this package by May 5th using the Rafflecopter widget below! My son really loves their Greek yogurt flavors, especially the strawberry, apple & beet one. 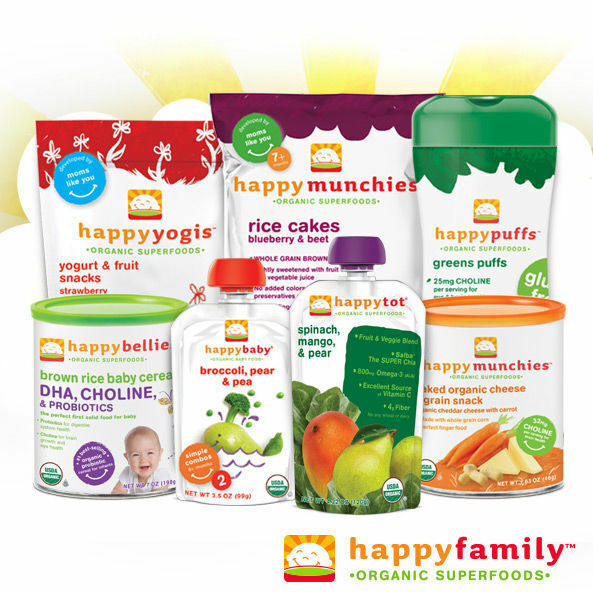 My daughter loves the HappyPuffs…Green Puffs are a favorite at my house! Love the banana, beet and blueberry mix! I would probably even eat that!